Ric O’Barry caught the first dolphin used in the 1960’s television show, “Flipper.” He subsequently caught four more to help with the television series. The show was filmed in his front yard essentially, with using dolphins he was responsible for training. The first dolphin died, committed suicide according to Ric. The stress of being held captive was too great. The dolphins were much smarter than we humans give them credit for being. As a result of his years of interaction with dolphins, Ric believed that dolphins were being systematically abused by everyone from the spectators at aquariums, to the institutionalized abuse at the hands of the Japanese. 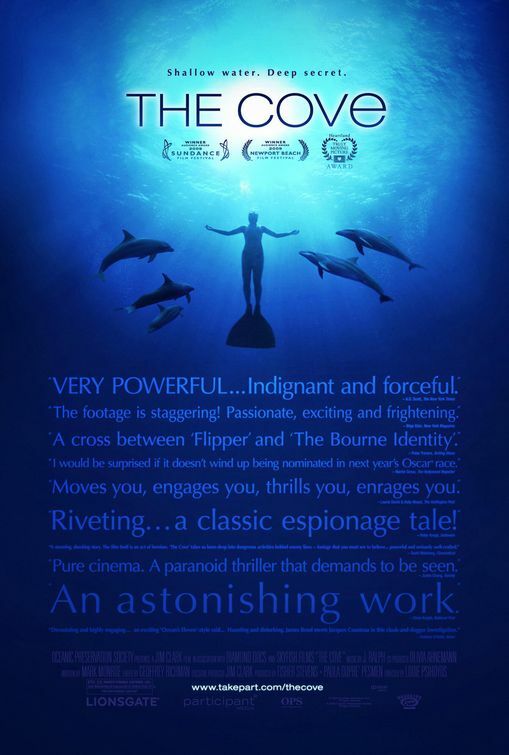 A very controversial film, as the Japanese fisherman are not portrayed as anything other than abusive murderers, and people that wrangle dolphins for aquariums are nothing more than criminals. In one small town, Taiji, hundreds of dolphins are rounded up for sale abroad, for use in shows like Sea World; are killed as an aquatic pest and a direct competitor to human consumption of sea food; and are also killed for food in Japan. Whether you agree or not, the film raises some interesting points. The IWC (international whaling commission) controls whaling activities. Since 1986, the IWC has banned whaling and the killing of dolphins. Japan refuses to acknowledge this ban. World fishing stocks are being depleted, and the Japanese argue that this is not due to increased human consumption, but due to increased consumption by dolphins and whales. The Japanese government sanctions the dolphin harvest, which is guarded by local police. Dolphin meat itself has a high amount of mercury, which is incredibly toxic, and is being introduced in the school systems without parent’s knowledge. Japan is also using economic incentives to encourage other countries to support Japan’s efforts to repeal the ban on whaling. This is a documentary so be prepared for slow moments, disturbing imagery of dead dolphins, dolphins dying, dolphins being cut-up, etc. The movie is not graphic throughout but does have its moments, and has some adult language occasionally. Otherwise, the film is pretty interesting and emotionally evocative.